How does Voicemail service work? How do I activate Bluetooth for my device? How do I block unwanted callers on my smartphone? What is premium SMS and how can I activate it? How do I identify fake android phones? How to set a Passcode on an iPhone? What is DND (Do not Disturb)? How do I connect my phone to the internet? As a Digicel smart phone user, you may need to know how to manually connect your phone to the internet. The simple steps and settings outlined below can assist you with the set up, however, note that this only applies to handsets that are bought at recognized Digicel outlets. 1. Go to "Settings" and select "More"
3. Then select go and select "Access Point Names" or "APNs"
4. 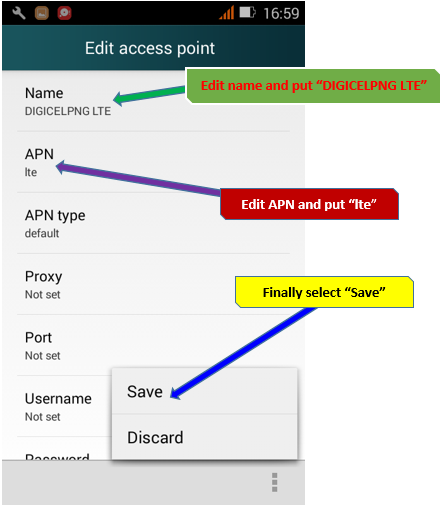 Select "Add New APN"
How to change network mode on device? How to set up Wi-Fi hotspot on your device? What is Voicemail and how does it work? Live chat available from: 6am - 11pm daily.